Mom! How do you make your turkey dressing? Lauren, if you have your own breadcrumbs, that is where you start. I save mine when I make Christmas Morning Wife Saver (at different times of the year) or when I am doing “fancy sandwiches” like I did from grandma’s 80th Birthday Celebration. I never throw them out, and they do keep for a very long time if frozen. Stale is fine. (mine are from homemade bread, below, left) I then dice them if they are not hard. And, usually, they are dry, but not hard. I also had some left over brioche (above, right, also homemade) from a dinner party and we couldn’t eat it all, so that is going into the stuffing, too. That looks fine. I like to have a variety of breads, if I can. I also always have a bag of the dry store bought dressing croutons on hand, too, should I not have enough in the freezer. This looks good. I never worry about the size of turkey I have. Odd, isn’t it. But I always make the same amount of stuffing. If the turkey is small, I stuff it up both ends and usually get it all in. If it is big, it seems to fit nicely. 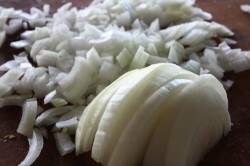 I use one very big yellow onion, and dice it then use a little olive oil in the frying pan and toss in the onion while I dice three generous stalks of celery: leaves, and all. The leaves add a lot of flavour. In goes the celery. 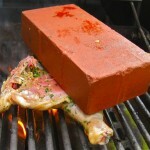 Keep the heat medium to medium high. 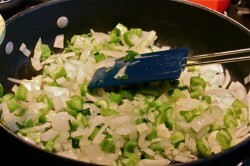 You do not want to caramelize the vegetables. You just want to sautéthem until they are translucent. Keep them moving. 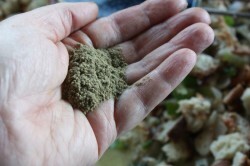 Add a generous amount of sage, but remember you can add more, but you cannot take it away. Start with 2 teaspoonfuls. Do the same with the salt and also with pepper. 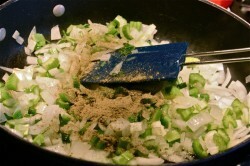 You will need a generous amount of freshly ground pepper. Stir it all in and keep watching the vegetables. It won’t take long. It should be fragrant. 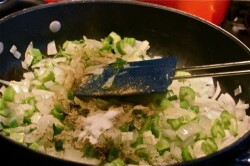 Add more seasonings later, not now. 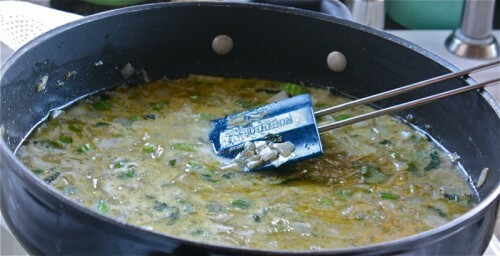 Add a generous 1/4 cup to 1/3 cup of butter and melt it in. You don’t have to use Sylvan Star butter, like I did, because I was making it super special to meet Jason’s mom and dad (that would be my daughter’s fiancÃ©s parents, for the rest of you), or Vital Greens Farms whole milk. But, what you do have to add should be wholesome and the best you can get because it is going into your body and you want to make healthy nutritious delicious food! As soon as the butter melted, I poured in enough milk to cover the vegetables. How much? 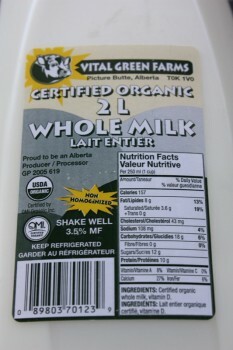 See below: it was 2 litres, so that much. This is what it looks like without the bread crumbs. Time to empty them into the wet mixture and stir them in. Woops! Not enough bread crumbs. 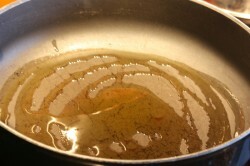 If you stir them in really well, you want to see no liquid in the bottom of the pan. When there is liquid on the bottom, like there is above, you know you need some more bread. This is also the time to add the extra seasoning. I needed about double of what I started with. 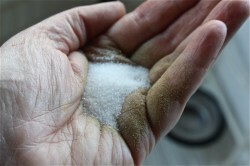 Don’t “over sage” or “over salt” it. The flavours will get more intense as it cooks inside of the bird. 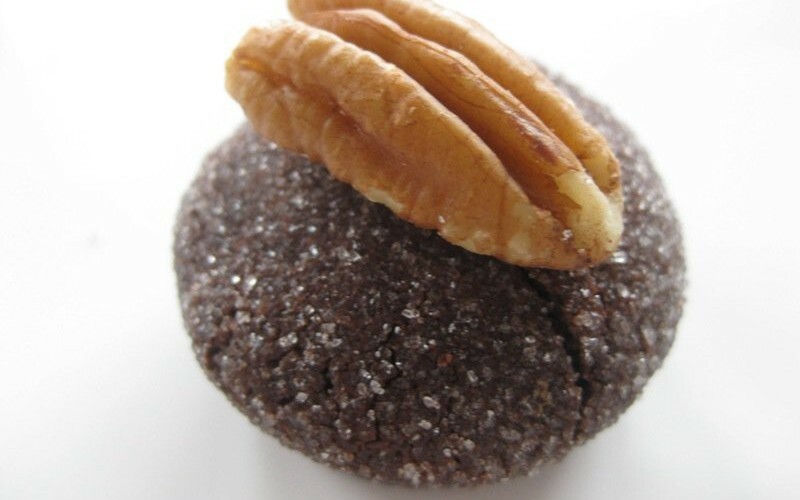 There goes those store bought crumbs (well, some of them) that I have in caseÂ I need them. Stir them in and ensure there is no extra liquid. These were very hard, so I let it set for about 30 minutes to see if it was the right consistency. It was. I did not believe any more liquid needed to be added. I have made this more times than I can count. It was seasoned well, and I then put it into another bowl and covered it with plastic to wait to go into the bird. And, when you do stuff it into the bird, do not pack it in. Stuff it in lightly so that it will be a lovely light dressing. Not a dense, packed one. 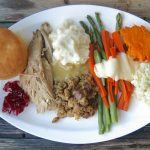 Many people believe it is not safe to put dressing in a turkey. For sure, it is good advice to put the dressing in only just before the bird is ready to go into the oven. I always stuff my bird with this, the simplest and most basic of stuffings, exactly what we have had in our family all my life and all of your grandparent’s lives. 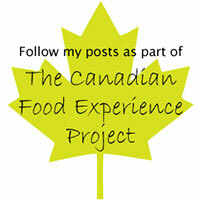 I hope you have fun making this for your Canadian Thanksgiving in Palo Alto! 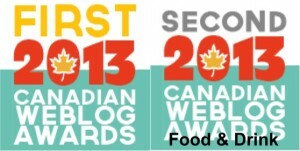 Chime in Canadians, Americans, Aussies, Brits, and others…. how do you make yours? I would love to know. « Thankful for my Farmers! Well, this is interesting! I would not use lovely butter as you did, because I don’t think it will show. But perhaps I am wrong. I have never seen the milk thing! That is totally unusual. I just sweat the celery and onions in butter with sage, salt, pepper. 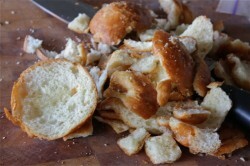 Toss in day old cubed bread. 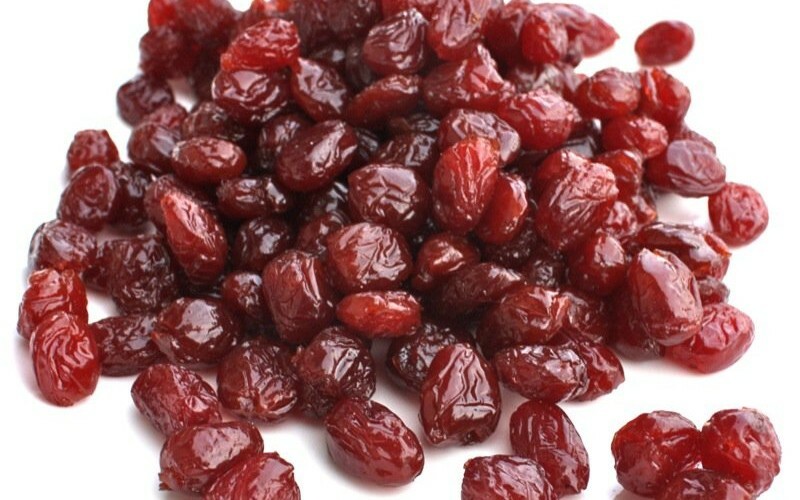 Perhaps add something fruity like dried cranberries, cubed apples, dried cherries or chopped dried apricots. Stuff it in both ends lightly. Thanks for the lightly, reminder, Sarah – I have to go back and add that in, for Lauren! I thought “everyone” did it like this. Mom always used margarine instead of the butter and always the milk. I love learning how others do things. Thank you!! 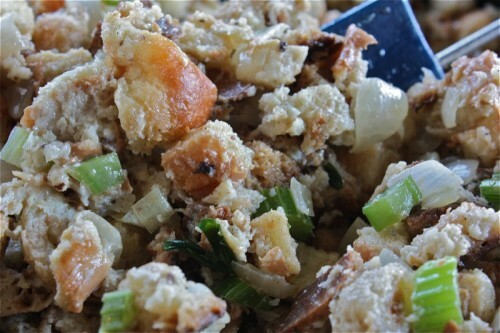 Yum, I have never used milk in my stuffing, either, but will try that right now. I was just making my “gluten, dairy free” version for myself, since this is the first turkey I will cook since my diagnosis and can tell you that I will miss the real stuffing terribly. My “safe” version tastes quite yucky. (A little pity-party here!) But never mind, the others will enjoy the “Valerie” version of my stuffing. Thanks for the great tip. Have a great Thanksgiving. We have sooooo much to be thankful for! 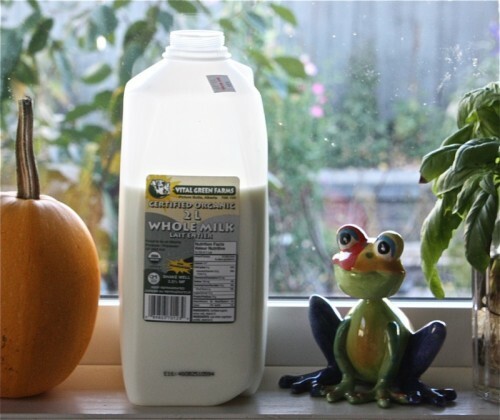 Our method is the same except we use chicken stock instead of the milk. I use thyme in addition to the sage. We also cook it in a casserole dish, not in the turkey and then pour on some drippings when the turkey is part way cooked. It only takes about an hour in the oven to cook. Great post! Hmm…I’ve never used milk in mine! I, like Colleen, use chicken broth. And I’m a sucker for poultry seasoning. I had seriously contemplated using mushrooms and bacon in my stuffing tomorrow…but alas, I think I would be the only one to appreciate it so I will save it for another time. 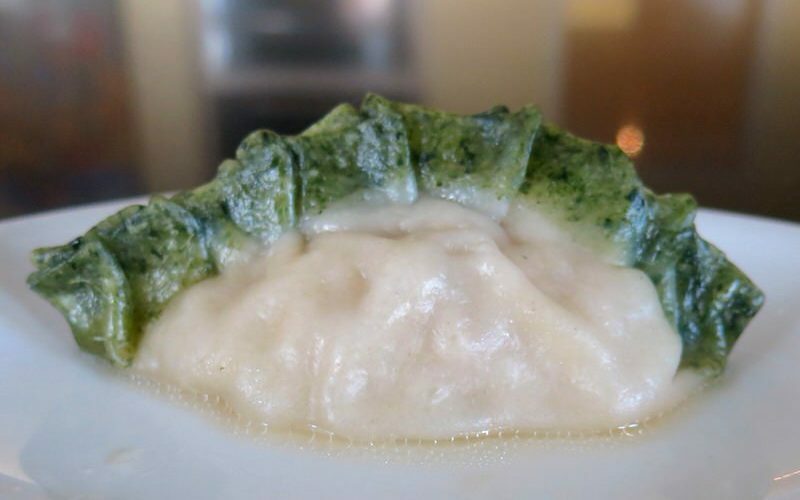 Sometimes keeping it simple is the key to a great tasting recipe! I have had stuffing before but have never stuffed my own turkey. It wasn’t until I moved out on my own that we (Gary and I) started having turkey for Thanksgiving. 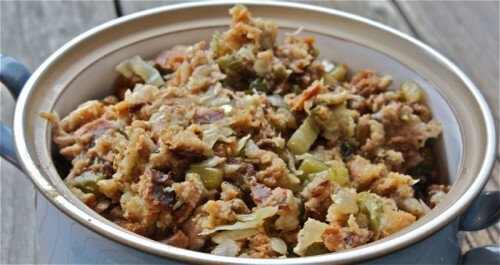 Our family usually just celebrated with a Chinese meal, so making stuffing is very new to me. 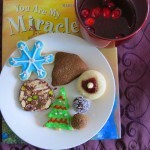 Thank you for your wonderful recipe. I love how simple it is. Gary and I are not big stuffing fans, but I think it’s only cause we just haven’t eaten one that we really like yet. I hope you and you family enjoy a wonderful Thanksgiving. I rarely make turkey or stuffing but I love to eat it! Yours here looks scrumptious and a classic; I dont see why one would not use milk, I am sure it tenderizes and adds moistness. 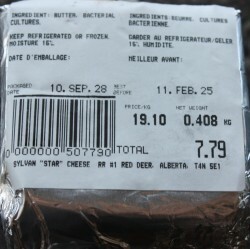 I love your measurements ;o) You’ve inspired me to make a turkey dinner today. It’s going to be 85F in Kansas today but I’ll be waving my Canadian Flag while serving it on Canadian Thanksgiving. Thanks for the inspiration as always! For every great cook I am positive there would be a slightly different recipe. Adding milk is an unusual step but my question is always what is the difference between stuffing and dressing:D To me stuffing is made with added meat. Since you asked, this is the basis of the dressing I have used forever. I think dressing recipes are pretty much the same although you add milk for moisture. 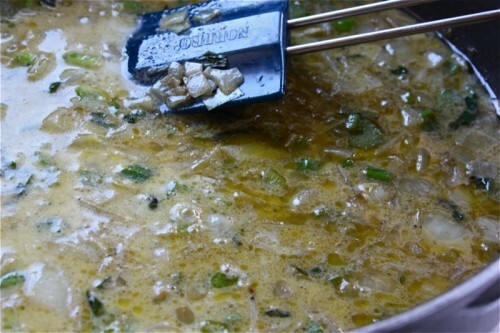 I have used chicken stock at times especially if I am going to make it outside of the bird. My ex husbands family also made it this way. My sister melts almost a pound of butter and puts it into her turkey!!! I tent the bread the night before so that it will dry out and then cube it in the morning. The seasonings may change in quantity since I judge by smell. On one of the Food Network shows I saw where they covered the turkey with cheesecloth which I might try this year. 1. 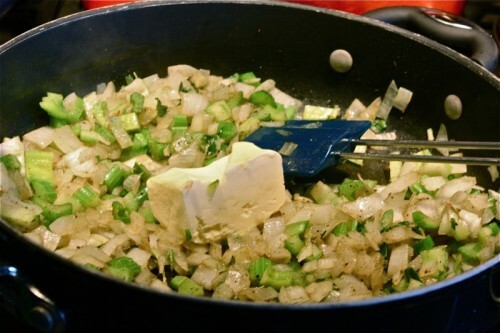 Melt butter over medium heat; cook onions, celery, sage, savoury, salt, pepper, and thyme, stirring occasionally, for about 10 minutes or until tender. Do you make Dressing or Stuffing? And, how do you make yours? I totally cheat on my stuffing, but my family LOVEs it. 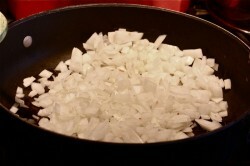 I sautee onion & celery, add in some craisins, then mix it in with Stove Top (at least 3 boxes) and specified water, place in casserole and warm just before serving. I just don’t like putting stuffing in the bird… it grosses me out. 🙂 Happy Thanksgiving! perfect dressing, I love that you add milk. 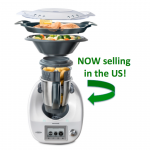 I can imagine it gives the turkey extra moisture and add a wonderful rich sauce, happy thanksgiving…and congrats to your daughter..
Congratulations to your daughter! I’m sure the next few months will be a lot of fun to plan a wedding. I haven’t committed to a dressing recipe, although I know that I love dressing that is stuffed into the turkey. I’ve never gotten sick, and enjoy that it is kept moist from the turkey juices. I will have to try this method with milk. 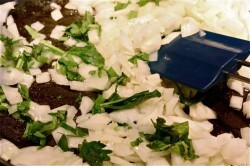 Your stuffing is much the same as mine except I sautéthe onions and celery in butter, not olive oil. 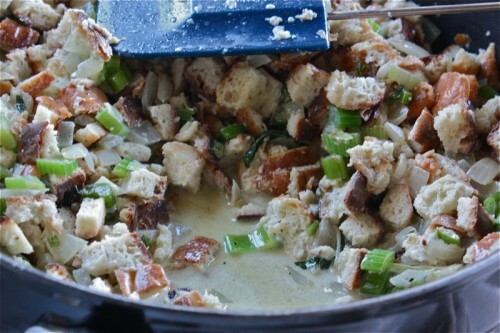 I add chicken or turkey broth to my stuffing in place of milk. This year I added some bacon pieces (baked until crisp) to the dressing. I don’t think it added that much and I’m going back to the plainer version next time. I make dressing with french bread, Irving Farms Bacon, 5 kinds of mushrooms from Mona, Walla Walla Onions, fresh Thyme and homemade chicken stock. 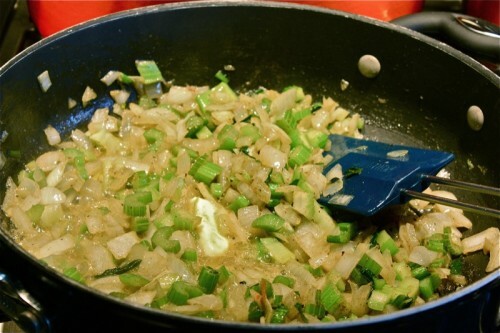 The fat from the bacon is used to saute the onions and added into the dressing to add flavour. This stuff is like a little piece of heaven! 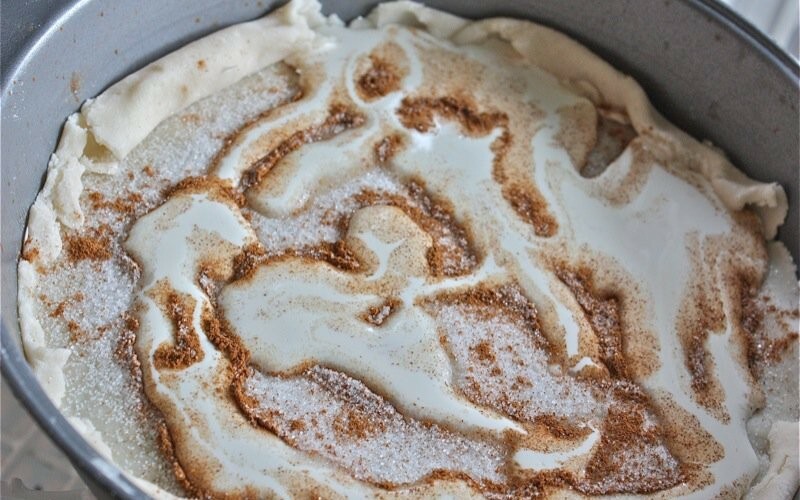 Your recipe sounds like a winner! Everything wonderful all in one dish! YUM! Mom never added liquid to her stuffing. 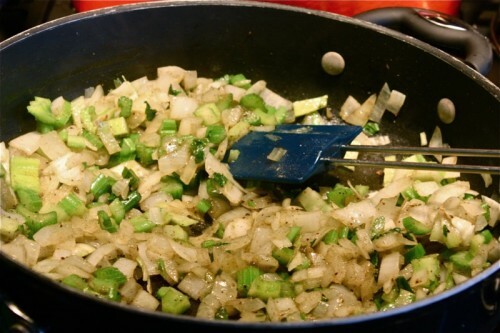 She used fine bread crumbs, sauteed with lots of onions and celery, in butter and/or oil. 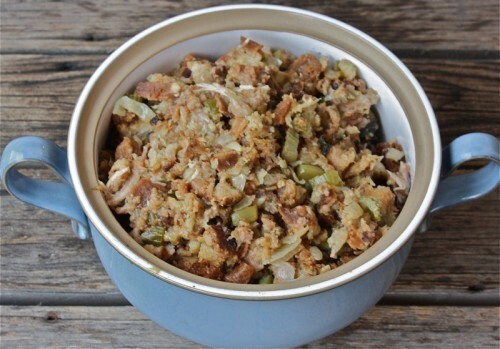 It’s a drier, finer stuffing than perhaps most people are used to, but it’s what I grew up with and what I love. And to me, it’s not stuffing unless it’s cooked in the bird. I think some people don’t like to stuff the bird because to get the stuffing up to a safe temperature it means that the breast will be dried out. A good point, but you can always cover the breast with foil for some of the cooking time to protect it, or use cheesecloth like someone upthread said. If I have too much stuffing for the cavity, I make a pocket in the skin over the breast and stuff it in there, which also helps keep the breast meat from overcooking. My family is having Thanksgiving turkey next weekend because both my nieces are going to be in town. Looking forward to it. 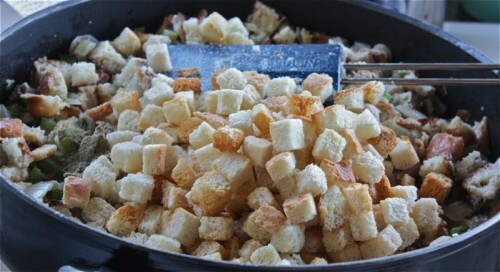 Your stuffing looks similar to our personal favorite, I typically use butter in stuffing recipes and not olive oil. Your stuffing looks really good. Your stuffing looks wonderful by the way. 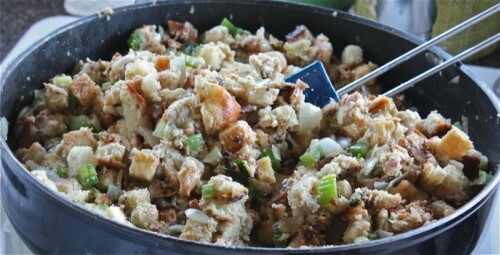 Stuffing was always my favorite part of Thanksgiving and Christmas. I’ve never made it in my adult life due to my mostly vegetarian/vegan lifestyle. I would eat yours though! 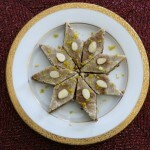 the picture makes me SO hungry! thank you for the tips mom! mine didn’t look or turn out quite like yours. 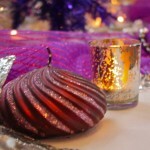 this christmas, prepare to have me glued at your side during your christmas feast preparations. I MUST learn HOW!!! I was traveling in South America last week and was unplugged. I rarely do anything the same way twice, but I can see some differences in basic technique/recipe. For example, I do not use butter or milk. Instead I prefer to add broth. Also I generally add some crumbled meat (like Italian sausage or Spanish chorizo); sometimes nuts and dried fruit as well. If I think of anything else, I’ll be back. Grocery Stores usually portion the chunky crumbs into bags that work for our family and I usually use one of them. Other than that, I suggest 10 cups of bread crumbs for a bird your size. 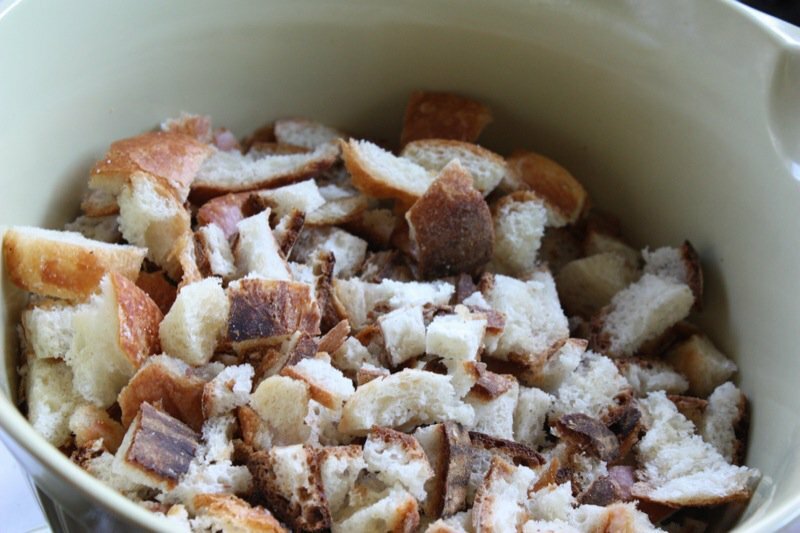 If you cannot find mixed (brown, rye, white) chunked crumbs, buy three loaves of bread – cube and dry them – and you have made your own… use crusty loaved, not sliced bread. 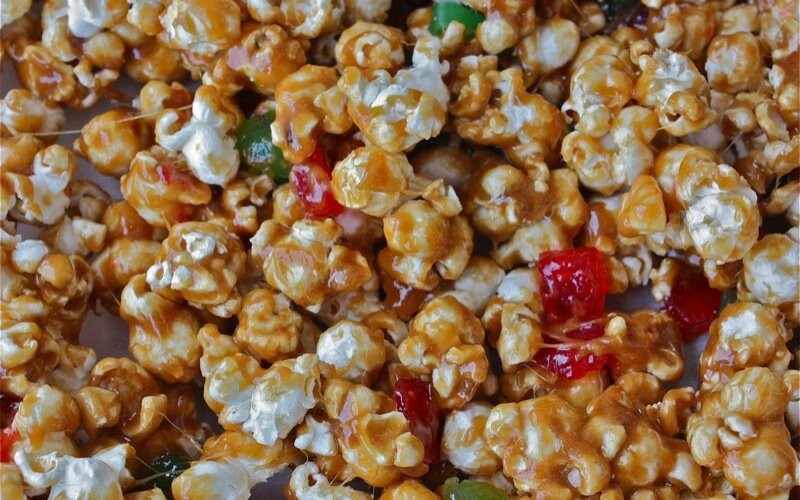 Valerie’s Christmas Poppycock (Caramel Corn): The Best Ever!